is inspired by the origin and decay of structures that serve as multi-layered records of human activity. 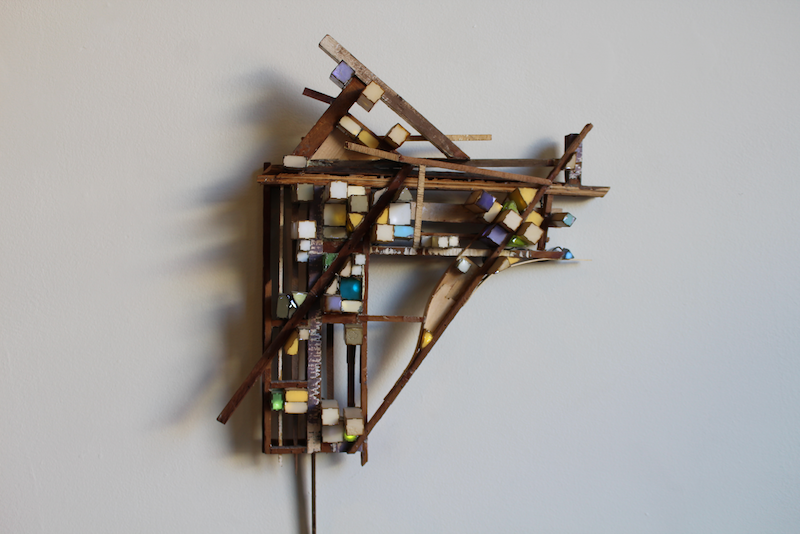 Using found, collected, and recycled materials, Banes experiments to make quirky assemblages. They are sometimes reminiscent of childhood forts or constructions in miniature. When viewed together, they become eccentric architectural models, wryly alluding to the seriousness of many ominous socioeconomic issues. Complex shapes, whimsical lines, and tiny details inspire an intimate exploration of these intricate sculptures. Get up close and enter this miniature world! The soft glow ignites a nostalgic peaceful feeling amidst the darkness. 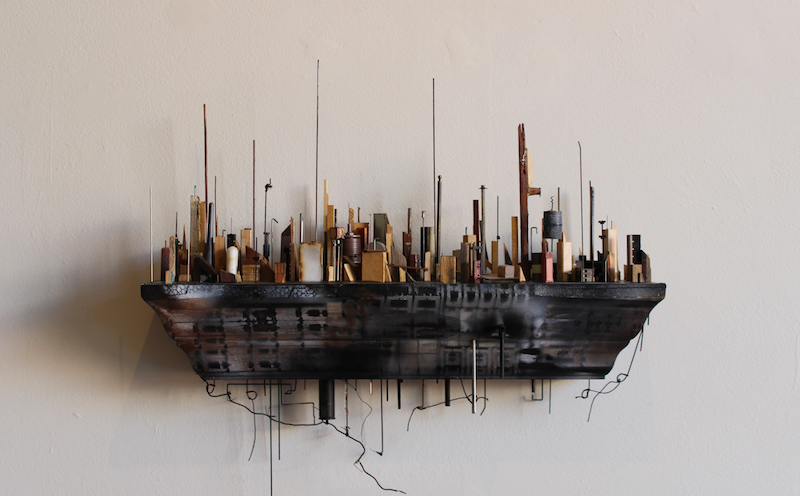 Jamie Banes’s sculptures have been shown nearby throughout Oakland, San Francisco and across the country. 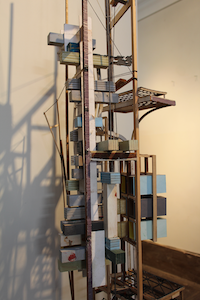 He creates these amazing sculptures at Autobody Gallery and Studios in Alameda were he frequently exhibits his work. 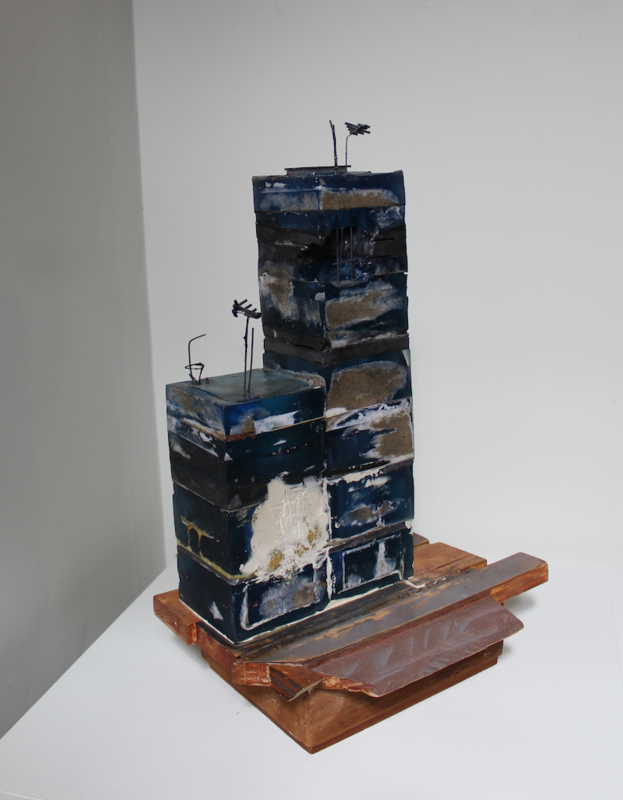 Ferrouge Gallery is very pleased to show his sculptures here through November! 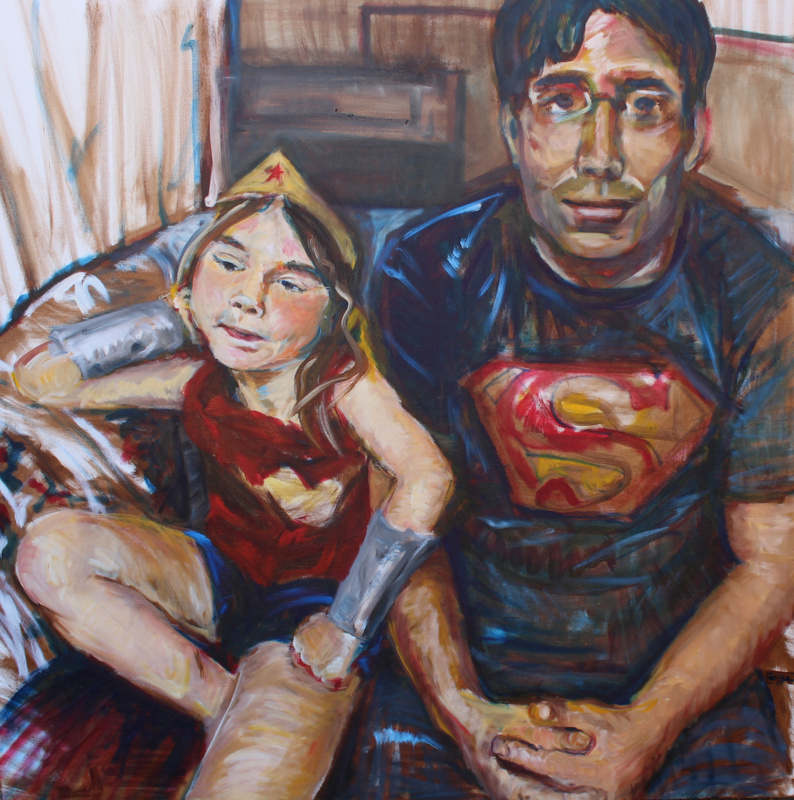 Artist Christine Ferrouge grew up playing Wonder Woman and has raised her three daughters to follow in her footsteps. 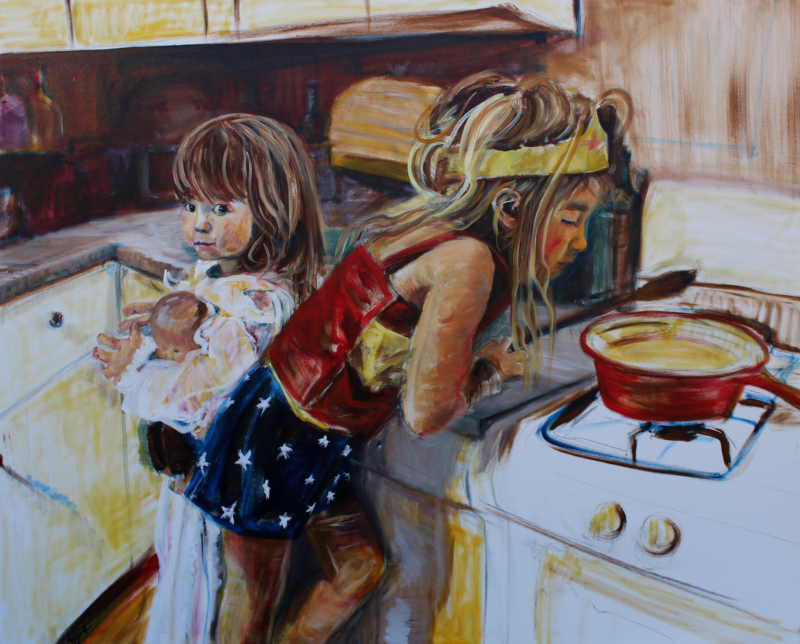 In her newest paintings, her confident little girls appear in super hero costumes from moments in the artist’s home-life. The paintings are rich in depth and contrast, while filled with energetic brushwork. In Superman is My Sidekick and Wonder Woman is Making my Lunch, the female hero is busy working or thinking and a side character knowingly look out at the viewer. Ferrouge explores other important messages of friendship, confidence, and sister relationships in Batgirl and Robin, Super Batgirl, and My Sister is Amazing. "The idea of Super Hero is important. These characters have an ordinary day job, but secretly do something extraordinary and significant for the people they rescue from danger. There is a sense of empowerment that occurs when one tries on costumes and plays these characters who fight for justice. It is that hope, seen in my children and their friends, that has inspired this work.” said Ferrouge. Ferrouge studied art in Florence, Italy; the Dominican Republic; Amsterdam and throughout the midwest. She received a BFA in painting and teaching certification from the University of Evansville, Indiana. After teaching in inner city Chicago and Los Angeles, she moved to Oakland where her studio practice continued to develop. Last year, she had a second studio in Fresno, California where she created paintings for her show; Children in the Valley. Ferrouge’s work can be viewed in her uptown Oakland studio, the Werkshack, on Saturdays and First Fridays.